(Nanowerk Spotlight) Perovskite materials, with their unique highly symmetric structure originated from natural minerals, are an important class of functional materials renowned with exotic electronic and magnetic properties. Complex oxide perovskite have been intensively researched for over half a century for their intriguing high temperature superconductivity, thermoelectric, ferroelectricity, colossal magnetoresistance etc. However, their large band gaps (typically >3 eV) limit their interaction with visible photons. More recently, the organic/inorganic hybrid perovskites have attracted enormous attention for their extraordinary photovoltaics performance, nonetheless they suffer inherent stability and toxicity issues (read more: "Perovskite solar cells – a true alternative to silicon?"). This further inspired rational design of new functional perovskite materials with suitable band gaps, and inorganic earth-benign and abundant elements, while retaining the appealing structural and optoelectronic characteristics. 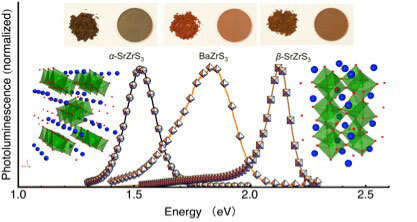 In a recent paper in Advanced Materials ("Bandgap Control via Structural and Chemical Tuning of Transition Metal Perovskite Chalcogenides"), Jayakanth Ravichandran, an assistant professor at the Viterbi School of Engineering at the University of Southern California, and his team, propose transition metal perovskite chalcogenides (TMPCs) as a new class of versatile semiconductors for optoelectronic applications. This work was performed in collaboration with Assistant Professor Rehan Kapadia's group at the University of Southern California and Professor David Singh at the University of Missouri. "We have identified the unique three-dimensional octahedral network and transition metal d-orbital degeneracy as key characteristics to achieve high density of states, ultra high absorption coefficients and other attractive properties in TMPCs," Ravichandran tells Nanowerk. The team synthesized several high quality polycrystalline TMPCs with an iodine catalyzed solid-state reaction process in sealed ampoules. "We succeeded in tailoring the band gaps of transition metal perovskite chalcogenides to visible region via replacement of oxygen with sulfur, a result clearly shown in photoluminescence spectra," notes Ravichandran. "We also demonstrated the tunability of optical properties, including band gap and absorption coefficient variations by carefully controlling the structure and chemical composition of these materials," adds Shanyuan Niu, a graduate student in Ravichandran's group and first author of the paper. "There is a large design space for this control in this materials family." The researchers evaluated the potential of the TMPCs for photovoltaics via luminescence efficiency measurements. Assistant Professor Rehan Kapadia, who was part of the study, noted: "We were surprised that one of the first generation multi-crystalline TMPCs (SrZrS3) showed luminescence efficiency comparable to single crystalline CdSe." "Our results suggest that the underexplored ternary sulfide perovskites could be a promising class of semiconductors with broad tunability and superior optoelectronic performance," concludes Ravichandran.